The model 6000 went through a development of over 2 years. 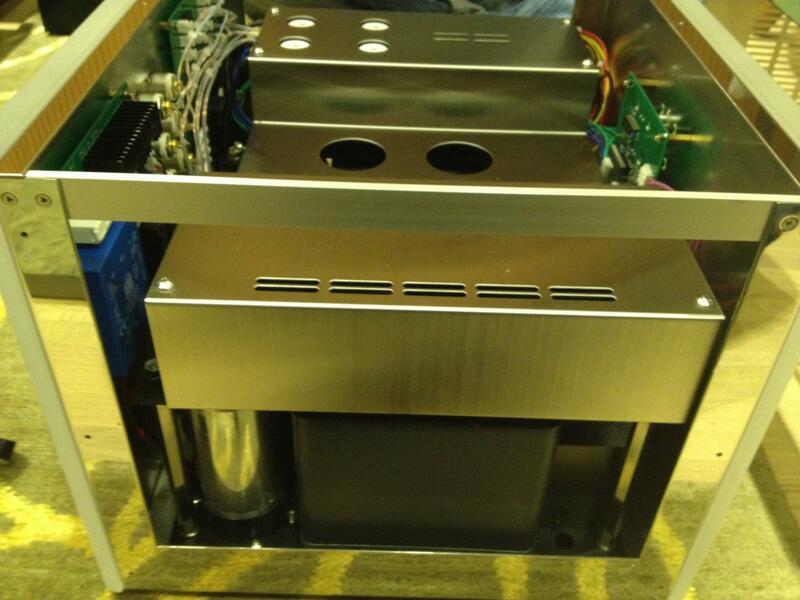 This is by far the highest power amplifier made by Zanden delivering 100watt in class A. 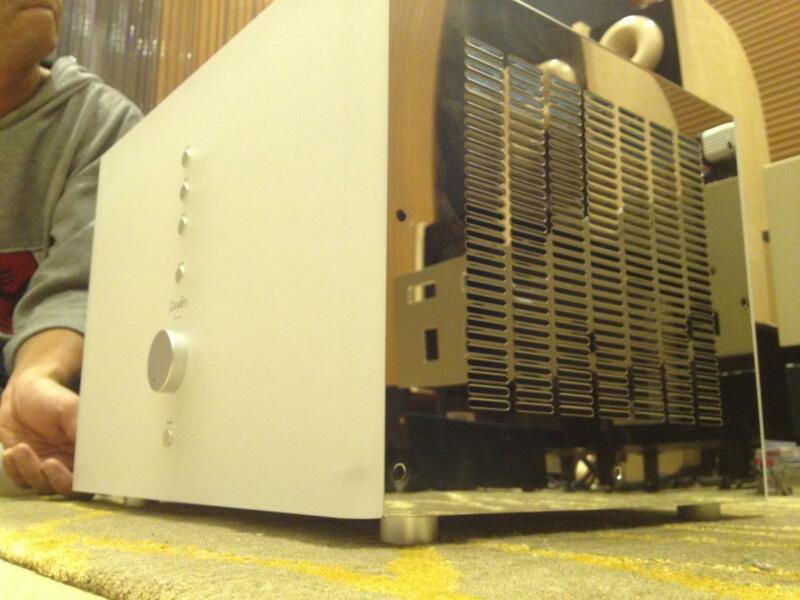 This is also the best looking amplifier made by Zanden in my subjective opinion. My photo skills cannot do the aesthetic of it in justice. But it is really cool looking. 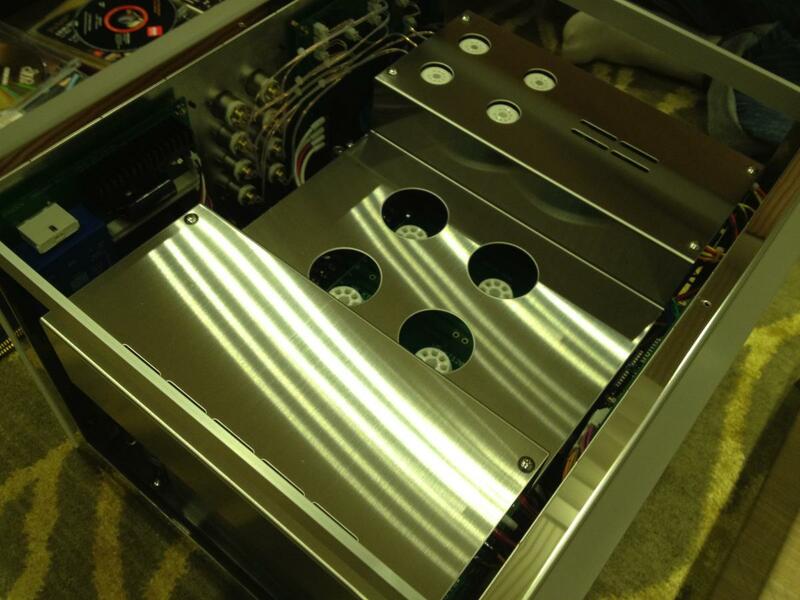 The internal structure of the amp is also beautifully polished. 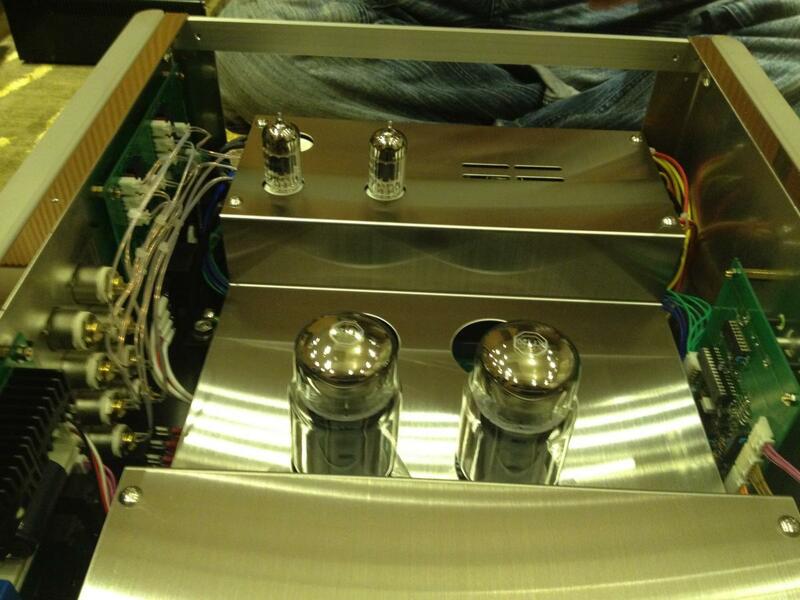 We started putting in two KT-120 tubes by Tungsol into the amp. This amp is extremely heavy according to our transportation guy. Actual weight ex packing is about 100 pounds. What is a good amplifier? After all these years, I believe I am qualified to say something about power amplifier. The test to Model 6000 is particularly stringent as the Chopin by Cessaro was serving by Da Vinci Masterpiece Virtu mono blocks. Danny listened to the Virtu only once for two hours and already took them back home last week. The benchmark is very high. Then the Takumi K-70 GENERATION 2 was in service for a week until this afternoon and people who had visited AE2 with the Chopin served respectively by Da Vinci and Robert Koda know well the standard achieved in this "small" room. 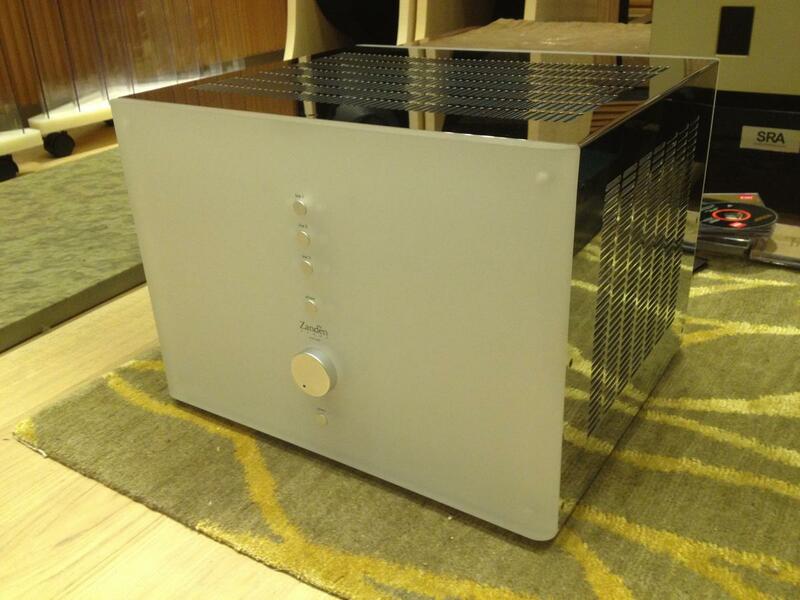 The Virtu delivers 40 watts class A. The K70 delivers 70 watt class A. Both designs are based on single ended circuitry. The Zanden Model 6000 delivers 100watt in class A in push pull config. We then connected DA VINCI preamp to the Zanden Model 6000 power amp. And the result is astonishing to say the least. Yamada told me on the phone yesterday that his amp will produce a huge soundstage. Frankly speaking, the soundstage at AE2 is already superb - all 4 walls disappeared as many had already commented. But today, when I closed my eyes, I clearly felt the extension beyond the 4 walls has clearly reached another level. To verify, I asked ah Chung to listen. We were staring at each other without words. We played recordings with more bass contents. We played many orchestra and symphonies. The dynamics are explosives without harshness. The transients are very fast and there is no overdamping of lower mid bass at all in spite of the 100watt power rating. Because of the unexpected positive surprises, we connected the THOR ground cable to the amp! This was really the moment of hi fidelity. You guys have to come to experience what I wrote here. And I am evaluating the amp from the perspective of its performance WITHOUT references to actual price or price/performance ratio per se. I reported what I heard and why I was surprised. Don't try the THOR ground wire unless you are prepared to be poisoned! I got a feeling of silence equivalent to listening to the original master tape. PT has demonstrated plugging and unplugging the Thor ground on the Tidal phono and it changes my impression on the Gabriel turntable compared to the NVS...ground noise is really blurring up the images creating the 'false' perception on air and smoothness....A much more flexible version of Thais ground wire!! 過去數月在AE2能夠聽到巨匠Takumi K70, Da Vinci Virtu mono和最近的Zanden Model 6000真係是大開耳界. 無論用那一部amp間房都隐了形. 令我最為驚叫的是達文西的Virtu, 質感的分析力有可能是當今之最, 但奈何我財富不厚, 只能放在心內渴望. 巨匠Takumi K10/K70 Generation 2是我能夠負擔的, 尤其K10前級已是AE兄弟一致選出的Product of the Year 2011, 實力已被各大哥肯定, 但K70三條頭所佔的面積令我太座不能接受, 最後將升级計劃暫時放低. 在亳無預期的情況下, 我和火四爺上週再上AE2聽下Zanden 6000咩料. 肥仔PT讓我坐皇帝位聽了一隻爆到九彩的DEBUSSY作品, 我真係有些被拋窒, 因為成隊樂團的排烈和發聲的位置十分之定, 份局清析, 而且那些所為的spatial cues好豐富, 高潮的發展交代清楚, 弦樂組幼细, 管樂组燦爛, 低音收放自如, 音場更是宏廣且內容豐富. 我真係流了幾滴汗! 原本想即閃避過毒氣, 但火四爺堅持要再聽多幾首. 再聽Sarah Chang的Brahams Violin Concerto, 雖質感未能可和Da Vinci同日而語, 但音色仍然是高貴的一類, 而且整個音樂的氣氛還原得好舒服, 估唔到是100 watt Class A push pull的功放. 從音象的線條感的分折出發點來說, 我覺得Takumi K70G2是最為清楚尤其還低音的细節, Zanden 6000更似Da Vinci的取向; 場面感是Zanden最為壯觀; 質感和總體速度是Da Vinci最好. 最後肥仔基拿了條THOR地線出來, 隨便放在Zanden機頂上, 嘩!有冇搞錯!嘩嘩嘩嘩嘩!!! 你地切勿問佢借, 火四爺已找了數在清衣區耀舞揚威! 而我亦投降, 因為我估不到Zanden 6000能夠這麼抵玩, 我原本也在考慮Audio Research和Audio Valve Baldur功放, 我聽過佢地也十分唔錯, 但呢部Zanden 6000是奇兵, 我無野講, Yamada先生, 的確有料到! The Thor ground wire is one excellent piece of wire that re-defines the definition of "silence". There is a "see thru" quality in the z-axis filled with cues. Palpability of imaging leapfrogs to a staggering level, albeit you do need to do some work out on speaker positioning to achieve this point. The Thais is damn good but the Thor has better "timing" resolution. This is a wire for the real guy who does not think conventionally in terms of what you see and what you pay. The value is in the music provided the infrastructure is up to speed. If I had described it wrongly, please chip in to correct me. I will drop by HK next week to listen. The magic of Zanden is well known. It is interesting for me to see how Yamada san fares in high power tube amplification. But judging from the responses of PT and Sergent Mak, the quality is warranted. I don't mind to explore the THOR if the demo unit is still there. This is the first time I truly recongize the justifications of spending so much on a ground wire. The application of Troy is a revealation. When ground noise is removed, it is just another ballpark of palpable musical landscape. Over the years, there are various ground wires introduced by Tripoint. Some of them sound different than other but I can't really say with confidence such invited differences are truly equivalent to improvement. The Thais ground wire is extremely good already though ocassionally there is a feeling of articifical "weight" jittering the pacing and rhythm of music that I knew since childhood. The Thor is another ballpark - it is a disappearing act like someone is waving a magic wand - enabling silence to be felt and to be touched. I do know I am talking senses and what I described is not a retreival from the imaginary space. It is real. When timing is corrected due to complete drainage of ground noises, the reward is not clarity in the 1st derivative but relaxation in the 2nd derivative. I agree with VR that this is a wire for someone who really cares about music; cost effectivess or whatever price performance equations are not applied here. And if you beleive you have a good pair of ears and want to save some money - dont FXXKING try it.